Matching up with the ever increasing requirements of the customers, we are engaged in providing Barcode Printer AMC Service. The services provided by our professionals ensure that the laptop functions properly at all times. These services are acclaimed for their unmatched quality, ease of provision and timeliness. 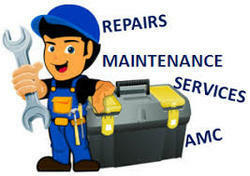 The flawed and defective components are either repaired or replaced based on the requirement of the clients. We "V. V. Printland Services", established in 1997, are one of the renowned wholesaler, and traders of a wide assortment of Dot Matrix Printer Parts, Inkjet Printer Parts, Laser Printer Parts and Printer Roller. There is a huge demand for our products in government and corporate offices. These are also sought after in the industrial sector that deals with printing. Our products are appreciated for their reliability, user-friendliness, durability and accurate dimensions. Furthermore, we also providing Repairing Service, Cartridge Refilling Service, and Printer AMC Service.